Last week, there were reports that Samsung is planning to debut the Galaxy M series later this month in India. The reports said the company would launch the rumored Galaxy M10, M20, M30 and M40 as the Galaxy M1, M2, M3, and so on. Purported specifications of some of these devices have also surfaced online in various benchmarks and leaks. 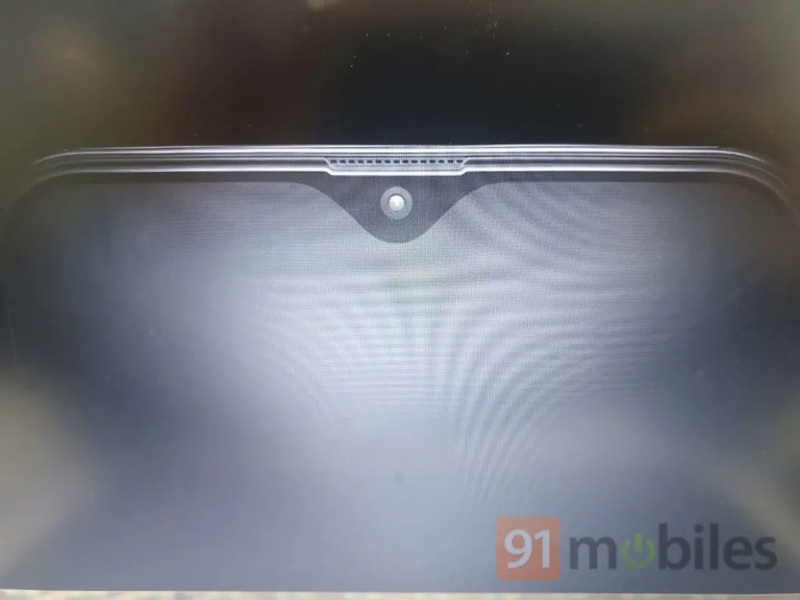 Adding to the growing leaks, 91Mobiles has now published a live image of the alleged Galaxy M20, and it matches what we have heard so far about the upcoming device. The image shows a device with an Infinity-V display (Samsung’s marketing term for what looks to be a waterdrop notch) and narrow bezels. According to the publication, the chin on the Galaxy M20 is apparently slimmer than the one on even the Galaxy Note 9. If so, then it is quite impressive since the Galaxy M series is supposed to be a budget lineup meant to replace the current Galaxy J, On, and C series offerings. The report also states the notch is surrounded by a “breathing LED strip” which lights up every time the device is unlocked. It sounds similar to the rumors we heard about the LED effects around the punch-hole camera on the Galaxy S10. On the backside, the device will sport a dual-camera setup at the top-left corner along with an LED flash. The rear side of the device will also house a fingerprint sensor. The back is apparently made up of polycarbonate with a glass-like finish for a premium feel. The bottom side of the device will have a 3.5mm headphone jack, a speaker, and a USB Type-C port for charging and data transfers. The report further confirms that the Galaxy M10 will sport a similar design to the Galaxy M20, but has a micro-USB port and is slimmer and lighter, probably due to the rumored 5,000 mAh battery in the latter model. Ok. Where is light sensor and proximity sensor ? This looks nothing like the Infinity-V that Samsung showed on stage. It looks just like the average teardrop notch that you can find in Huawei and OnePlus phones. Samsung deserves to get harsh backlash for this stupid move IF they actually do it and this leak is real. Yawn, another half-assed solution for a non-problem. Just give me some bezel and be done with it. It looks much better than that stupid hole in S10. Wow it look amazing ! I think he means the LED strip is in software. As in, the pixels around the notch will light up. I think you are right bro. Yes, the image doesn’t show it, but the front camera/notch is supposed to be surrounded by LEDs for neat design effects while interacting with the phone. The same is rumored for the Galaxy S10 as well.